Internet Explorer versions 6.0 or above. Firefox version 2 or above. Google Crome, version 1.0 or above (with some issues). Netscape version 6 or above. Firefox 3.0 may have some loading/viewing issues. Netscape is no longer in development or available since March 2008. Other versions of these browsers (or other browsers) may not be compatible with the Internet Map Server software. Choose to allow scripting. For pop-ups, find a section for "Miscellaneous" and then choose "disable" for the item "Use Pop-up blocker". For pop-ups, you may either uncheck the box next to "Block pop-up windows" or add the address http://ims.wvgs.wvnet.edu in the exceptions section. • Check under "Edit, Preferences, Advanced" . Recommended minimum screen resolution of 1024 pixels X 768 pixels or more for optimal viewing. You may wish to consider downloading and installing these free applications for viewing linked data via our maps. The following links are non-WVGES and registration may be required before download. Adobe Reader or Foxit Reader for reading PDF files (e.g., documents, charts). AlternaTIFF or Brava!®Reader for viewing TIFF images (e.g., mine maps, well logs) within a web browser. Download the ones appropriate for either Internet Explorer or Firefox. Of course, you may wish to use your own favorite PDF/TIFF application, outside of your web browser. 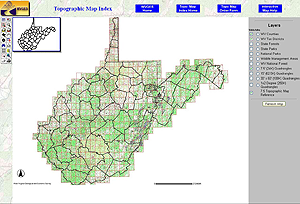 Featuring both West Virginia and regional (WV with contiguous states) oil and gas maps. More than 145,000 oil and natural gas well locations and data. 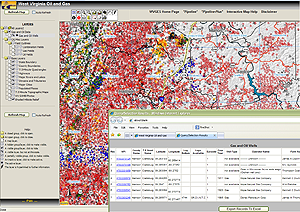 Links from oil and gas well points to extensive well information via WVGES' "Pipeline" and "Pipeline-Plus" applications. An Appalachian Oil and Natural Gas Research Consortium (AONGRC) Project. Map featuring geologic, well and resource information about the Utica Shale play in Kentucky, New York, Ohio, Pennsylvania and West Virginia. 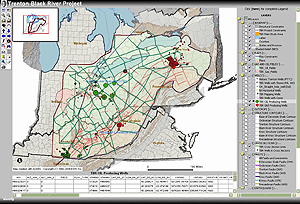 It is the culmination of a two year study of the Utica Shale Appalachian Basin Exploration Consortium involving 15 industry members, 4 state geological surveys, 2 universities, 1 consulting company, the U.S. Geological Survey (USGS) and the Department of Energy's (DOE) National Energy Technology Laboratory (NETL). 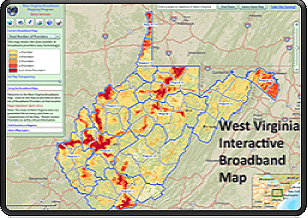 The Consortium was coordinated through a coordinated effort between the Appalachian Basin Oil & Natural Gas Research Consortium (AONGRC) and the West Virginia University Shale Research, Education, Policy and Economic Development Center. 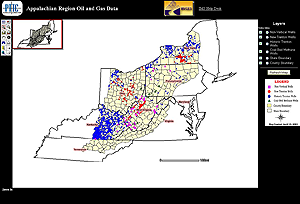 Marcellus Formation in West Virginia NEW! 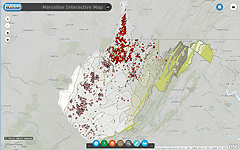 Map featuring geologic information about the Marcellus Formation in West Virginia, of current exploratory and development interest for gas resources in the Appalachian basin. An Appalachian Oil and Natural Gas Research Consortium (AONGRC) Project, featuring a basin-wide research effort on these Ordovician plays. 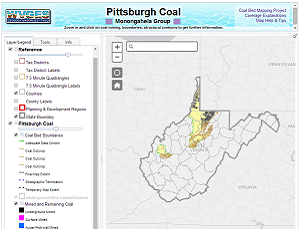 ☛ Note, the PTTC Appalachian Region Oil and Gas Data map will be decommissioned in the near future. Other maps on this page supersede this one in terms of quality and quantity of up-to-date data. A Petroleum Technology Transfer Council (PTTC) Project. 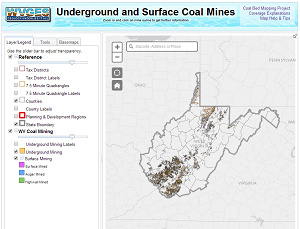 This map allows users to display selected historic and recent Trenton-Black River, coal bed methane, and non-vertical wells for the Appalachian Basin. An update of data/layers is planned. View general information pertaining to all underground, surface, auger and highwall mining within the state. Use this map to find and order paper topographic maps. 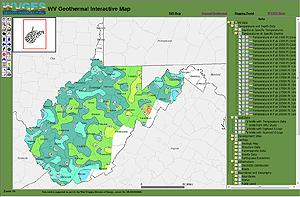 Use this map to find geologic geothermal information. 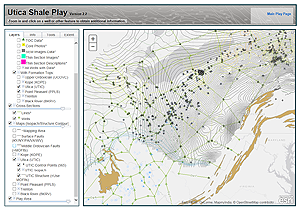 View data in relation to other geological features, infrastructure, development sites and more!